Our short summer is in full swing! It's a season that brings tundra flowers, lots of subsistence fishing and hunting, and – especially at our studios – lots of construction, renovation, and maintenance work. As you'll find below, we're taking advantage of our sunny skies and relatively warm weather by opening our toolboxes and reviewing our blueprints, to make sure that our facilities are as efficient and as well-equipped as they can be. 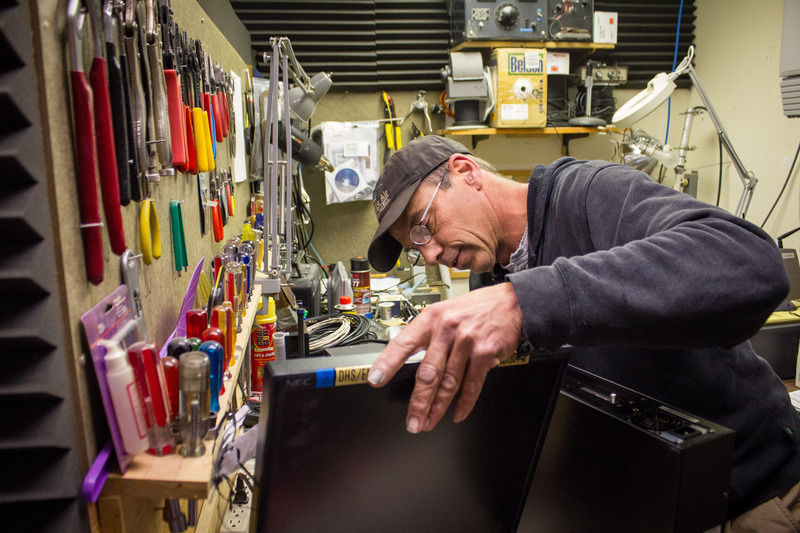 By making our studios better, we hope not only to save money, but also to keep KNOM on the air for many years to come. Last month, we looked back on the years that have passed as we celebrated KNOM's 41st birthday. Any anniversary celebration would be incomplete without acknowledging the wonderful young volunteers who have taken on a myriad of challenges to make KNOM the dominant source of information, inspiration, and fun in Western Alaska. In August, as you'll read below, we say goodbye to one of these volunteers. 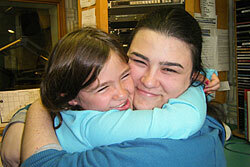 We invite you to join us in prayer and in gratitude for all who have kept KNOM on the air. Now more than ever, we thank you for standing with us and for making possible the many different elements of our mission. Whether by broadcasting weekly Catholic Mass to those unable to worship with a priest; ensuring that emergency information and news are received by those who need them (as described below); or airing unique entertainment to an isolated area, you are making incredible things happen and changing lives every day. Thank you so much. 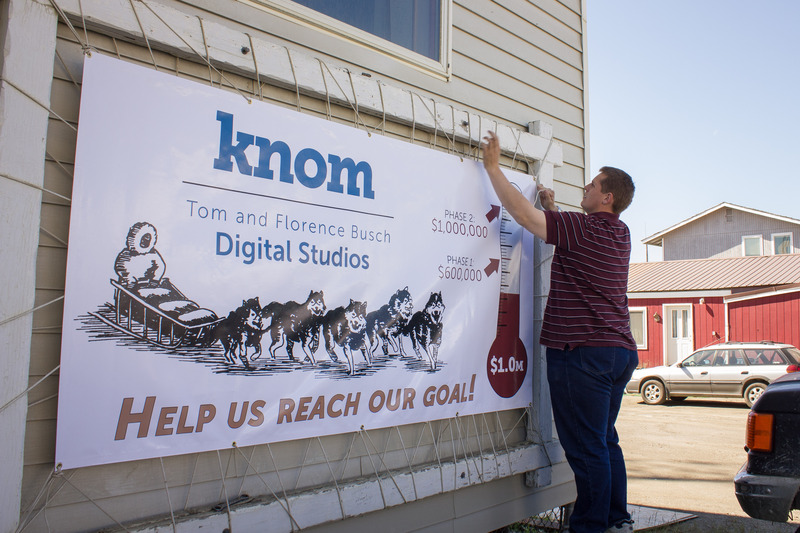 We're amazed and so grateful for the outpouring of support we've received for the Tom and Florence Busch Digital Studios, our studio expansion project. The generosity of our supporters, both within Nome and across the country, has allowed our fundraising thermometer to climb ever closer towards our phase-one goal of $600,000 (and, ultimately, towards the phase-two goal of one million dollars, to see all of our needed studio renovations completed). 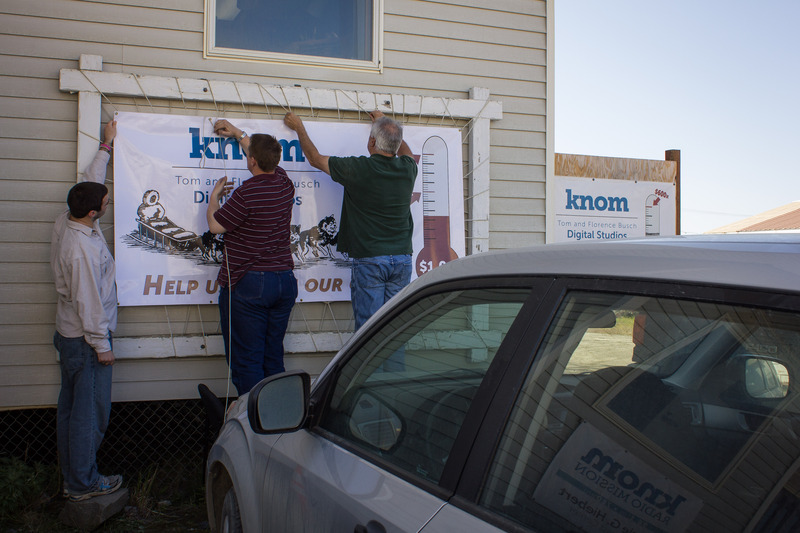 In light of the heartening progress of our digital studios campaign – and to mark the 41st anniversary of our first broadcast, on July 14th – we've replaced the banner hanging in front of KNOM's Nome studios. The previous banner celebrated our 40 years on the air; the new banner – as pictured above, being fastened by KNOMers Matty Guiffré, Matthew Smith, and Ric Schmidt – shows our progress towards making our studio goals a reality. 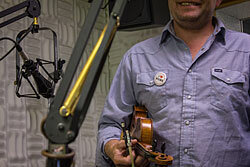 At press time, our studio fund, including pledges, stands at $359,796.19. Read more on our studio construction below. Summertime at KNOM is always made bittersweet by the departure of our wonderful volunteers, as they complete their years of service and move on to apply their talents elsewhere. This month, we bid farewell to our volunteer music director, Rebekah Pierce, who has given a year of outstanding, dedicated service to our mission and to the people of Western Alaska. 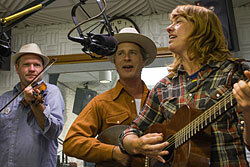 Among the highlights of Bekah's year at our mission is her creation of a new music show, Village Detour, which features the people, music, and song requests of a particular community that KNOM serves. 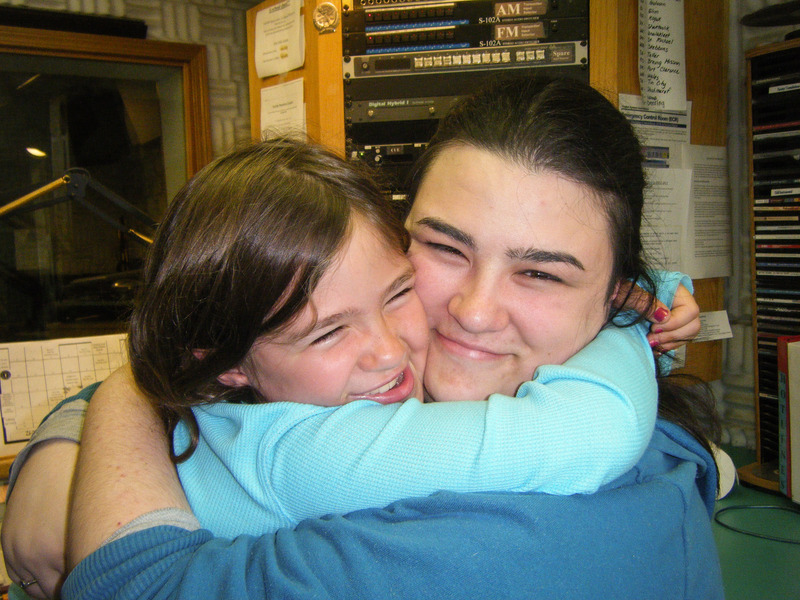 Bekah has continued to work on the show right up to her final weeks at the station, and most recently, she's had help doing so from her parents, sisters, and a close friend, who came up to visit Bekah and experience rural Alaska in late June. The group traveled to the village of Teller, where they helped Bekah find willing participants for her latest Village Detour. 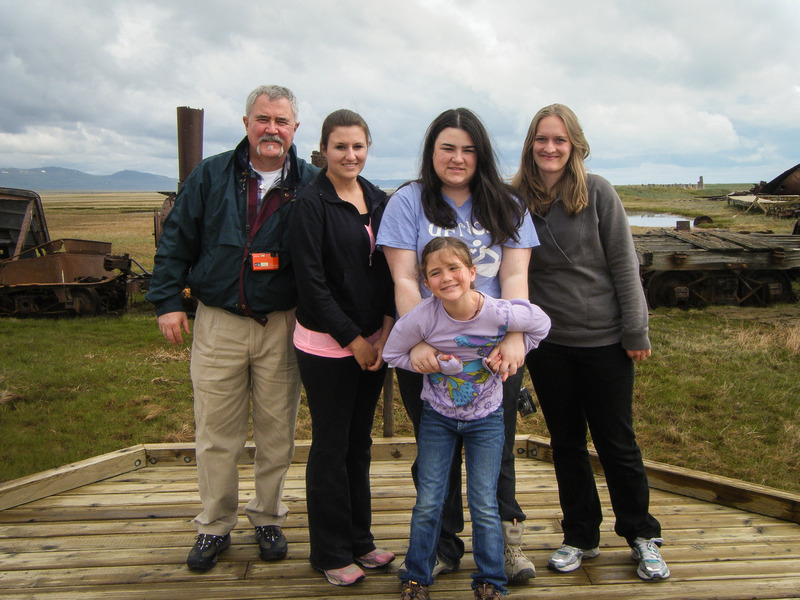 They also spent time in KNOM's Studio A – where Bekah is pictured with youngest sister Kathryn – and at various sites along the countryside near Nome. Pictured with Bekah are, left to right: her father Gene, sisters Emily and Kathryn, and friend Alexandra. We wish Bekah every future success, thank her for her service, and thank you for making it possible! God never asks about our ability, only about our availability. 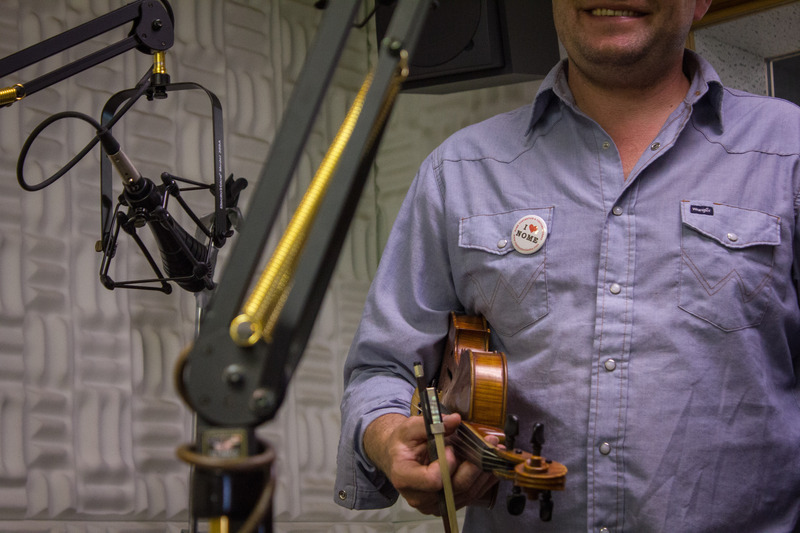 In late June, our studios were filled with the sounds of country music old and new, courtesy of a band visiting for Nome's annual Midnight Sun Folk Festival. 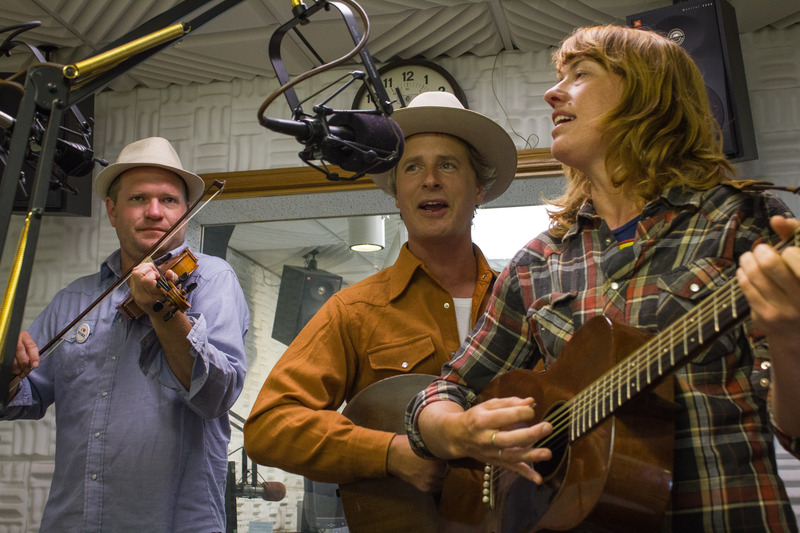 Featuring a wide array of live music, food, and arts and crafts, the not-for-profit festival is one of the highlights of life in our small town. 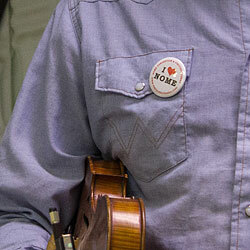 While KNOM does not sponsor the event directly, we are major source of information about each year's festival events. 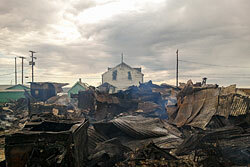 Just a few days before press time, one of the communities in our listening area faced a serious fire that consumed three of its buildings and threatened its Catholic church. 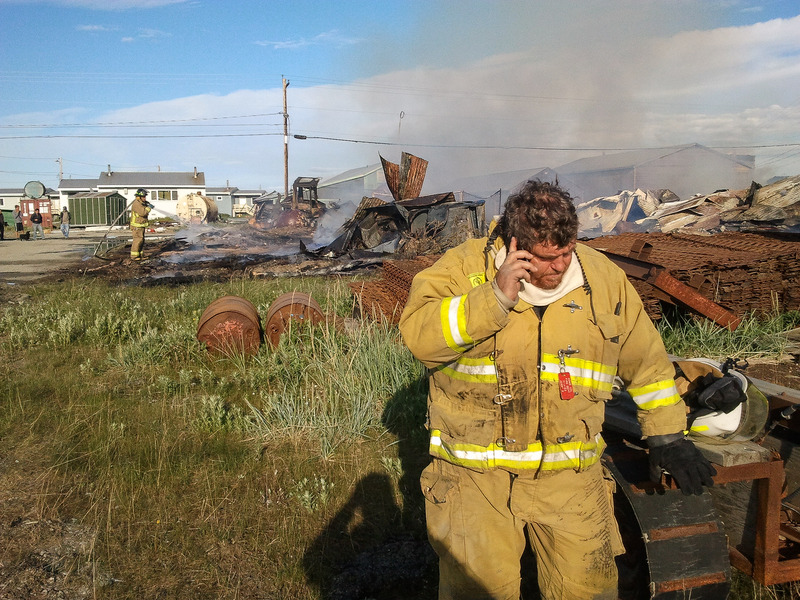 In the early morning hours of July 12th, volunteer firefighters from Nome hurriedly flew to Teller – a village on the western coast of Alaska's Seward Peninsula – to fight the blaze. 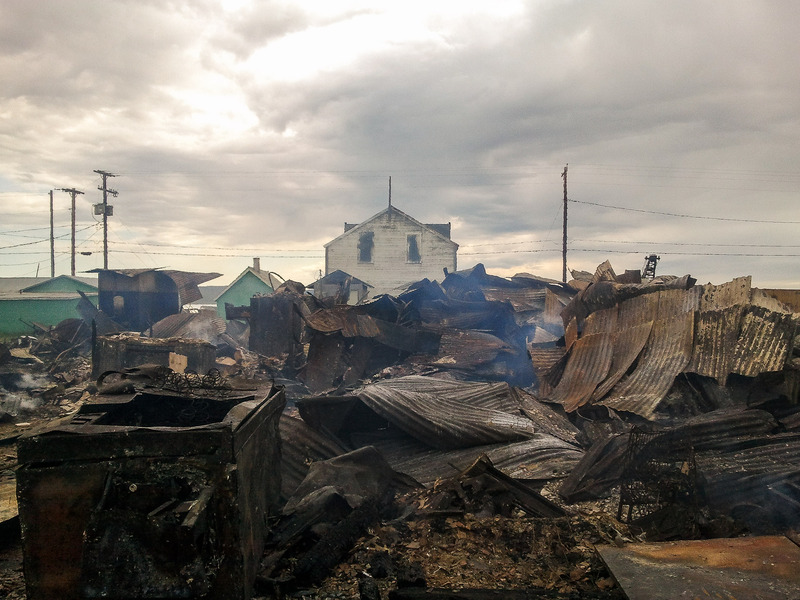 As you'll see in the four photos at left, the fire left behind a large field of debris, but thankfully, no one was harmed, and thanks to the efforts of Nome's firefighters, St. Anne Catholic Church was spared. We can't thank you enough for making our local news reporting possible. Especially at such moments of exceptional crisis, broadcasting the latest information means so much, and your generosity makes it possible. 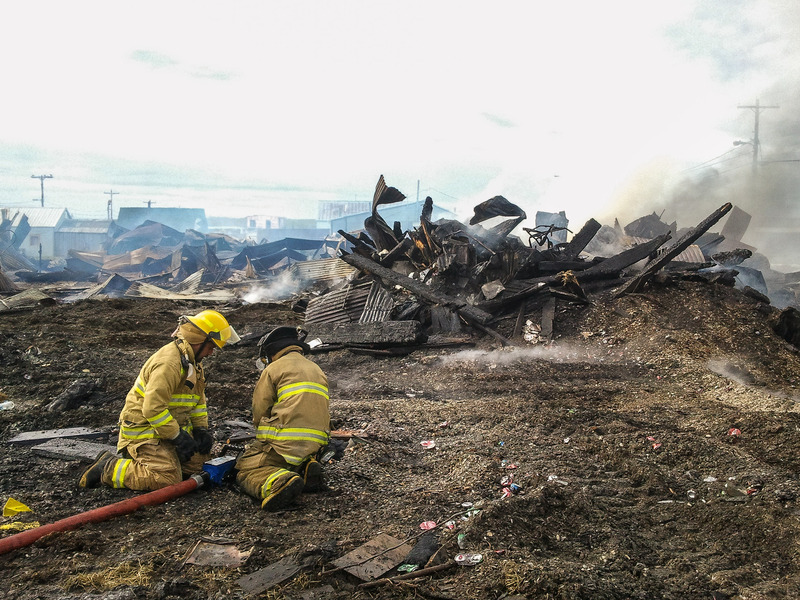 For a more detailed account of the Teller fire – and for the latest on this developing story, whose cause remains under investigation as we go to press – visit our news page. I wondered why somebody didn't do something. Then I realized that I was somebody. Over the past few months, we've upgraded the mechanism by which KNOM relays emergency alerts. Known as EAS (Emergency Alert System), this hardware gives state and national authorities the ability to broadcast official information in the event of dire regional or national situations. 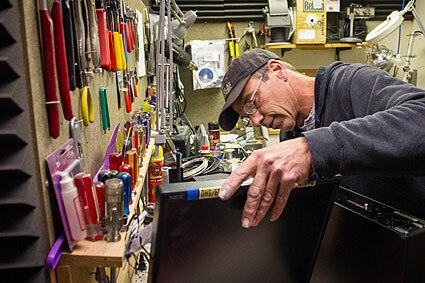 KNOM has always had EAS equipment on hand, but now, that equipment is digital and internet-capable: thanks to an installation from David MacPherson (pictured above) and further assistance from Nome's Dennis Weidler. 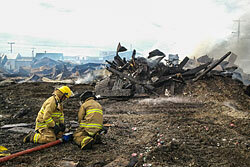 Thankfully, our EAS equipment has only rarely been used (aside from weekly tests). 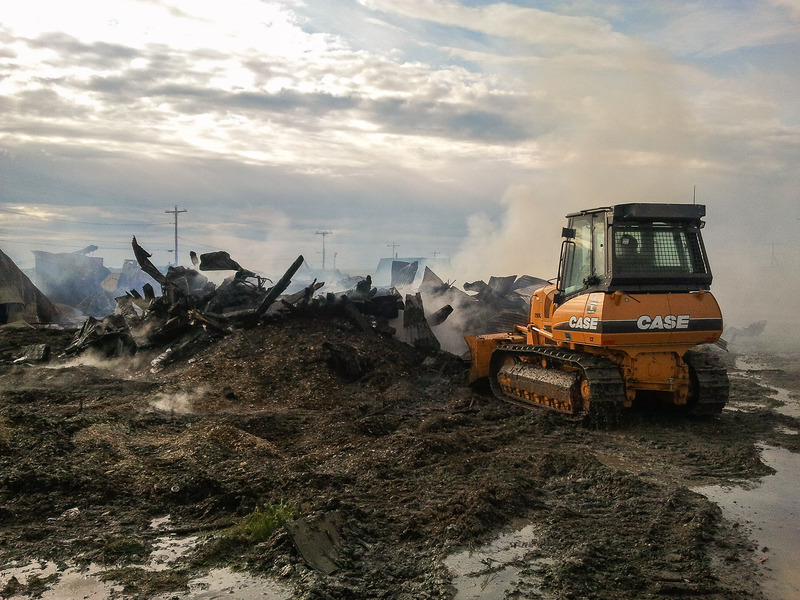 We're so grateful to David, Dennis, and all of our supporters for helping to make KNOM a reliable source of information – even when the unthinkable happens. 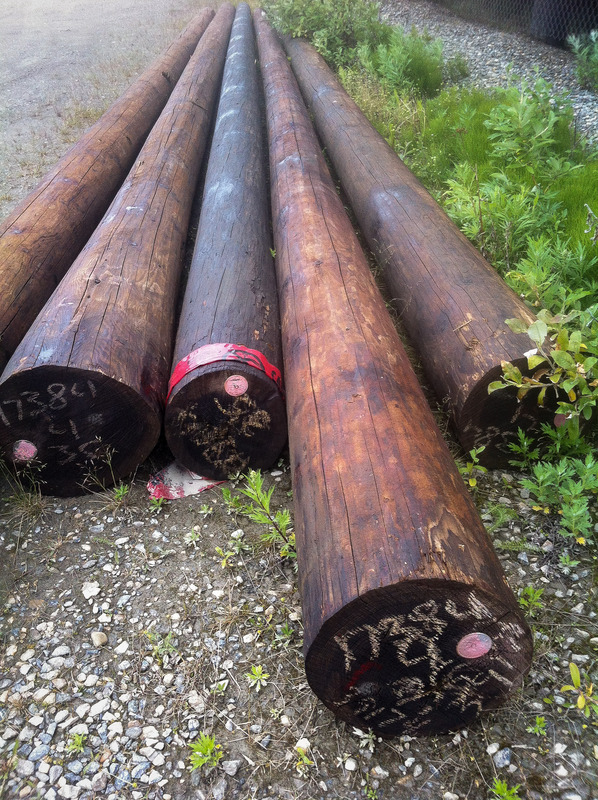 By the time you read this, the pilings you see pictured above should already be in the ground. 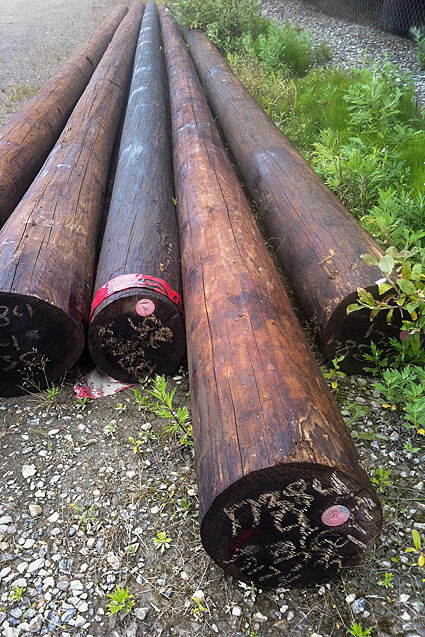 These large wooden poles will be the foundation for The Tom and Florence Busch Digital Studios. As you may well know from prior issues of the Static, our new studios will allow us both to expand our working space and to renovate it, using new technologies (including LED lights, as described below) that will make our operations more cost-effective. Since Western Alaska's climate does not permit us to lay a concrete foundation, these wooden beams, driven 30 feet into the permafrost, will give our new studios their needed support. 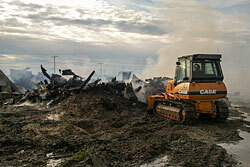 The final studio building, like all structures in Nome, will actually sit a few feet above the ground. You can spend it any way you wish, but you can only spend it once. As we've written time and again in this newsletter, making KNOM's facilities more energy efficient is a goal we're constantly pursuing. 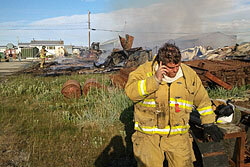 The need to save money on power use is greater than ever; Nome's electricity costs more than $0.30 per kilowatt-hour. As you might suspect, saving money on operating expenses often involves many small solutions – just like small expenses, small savings in our bills add up to a lot over time – and it often requires us to explore new technologies. 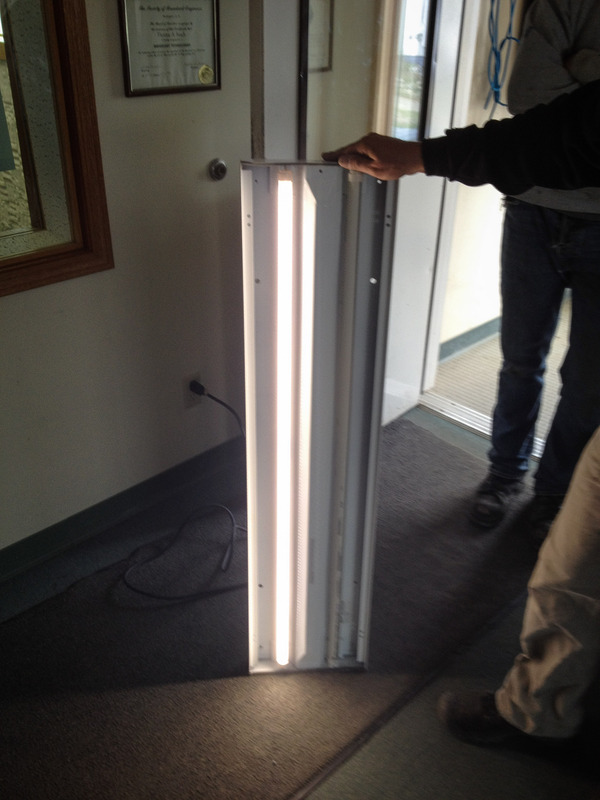 The latest energy-efficient initiative for our studios is a small solution that we hope will have a large impact. 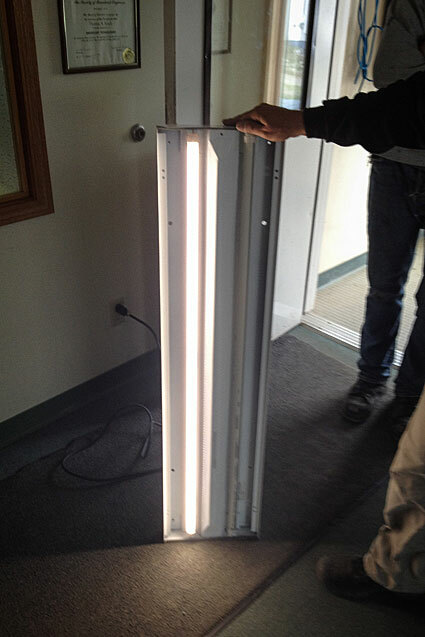 We plan to replace all of the fluorescent lights that illuminate our buildings with bright LED lights (like the one pictured), which shine more brightly but use less power than their fluorescent counterparts. The installation will cost just under $14,000; we ask for your prayers that donors may step forward to provide the needed funds. We've used LED lights in the past – for the warning beacons at the top of our AM transmitter tower – and have seen substantial savings; in relatively little time, the investment pays for itself. Thanks to you, we're looking forward to bringing this energy-wise technology indoors.